Zora Earlene Whittington, 79, of Cary, peacefully went to be with her Lord and Savior Friday, January 5, 2018 at Rex Healthcare in Raleigh. Earlene was born February 9, 1938 in Sampson County, NC to the late Martin Luther Brown and Izora Verdie Page Brown. She was a loyal and hard working manager with Woolworth's and IBM cafeterias. But, her true love was working for the Lord. In 1970, she worked as Kitchen Manager for the local Church of God of Prophecy to help raise the funds for building the All Nations Fellowship Church of God of Prophecy of Raleigh, where she remains a member. 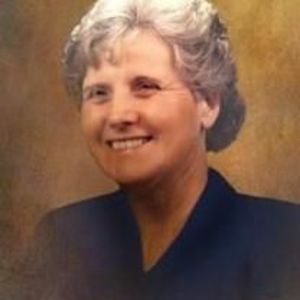 Earlene enjoyed attending 3 terms of Bible Training Institute and served as an Evangelist in the church for many years. In January of 1990 she became Pastor of Louisburg Church of God of Prophecy and served in that position until 2008. At that time, Louisburg and Bunn Chapel churches merged and Earlene served as the Pastor until she retired in 2012. She leaves her loyal husband of 62 years, Thomas Oliver Whittington; daughters, Sharon Megan Allen and husband, Scott of Raleigh and Wanda Elaine Whittington of Willow Spring; sister, Verdie Matthews and husband, Jesse of Autryville; grandchildren, Jeremy Bagley, Rev. Chad Bagley and wife, Nichole, Christy Hart and husband, Charlie, Aaron Goewey, and Ashleigh Goewey; great grandchildren, Elijah Bagley, Jace Bagley, Courtland Whittington, Nora McNeely-Bagley, Zoey Bagley, and Caylee Hart; and many nieces, nephews and extended family. She was preceded in death by her brothers, Wilbert O. Brown, Rev. Luther E. Brown, Edgard (Buddy) R. Brown (sacrificed his life in service during WWII), Rev. Rupert E. Brown, Rev. James C. Brown, Martin L. Brown, Jr., Baby Boy Brown, George T. Brown and Thomas J. Brown. A funeral service will be held at 1pm Tuesday, January 9, 2018 at Apex Funeral Home, 550 W. Williams St, Apex, NC 27502. Burial will follow the service at Harnett Devotional Gardens in Dunn. The family will receive friends from 6-8pm Monday, January 8, 2018 at the funeral home. Memorials may be made to the Alzheimer's Foundation of America, American Heart Association or Church of God of Prophecy.